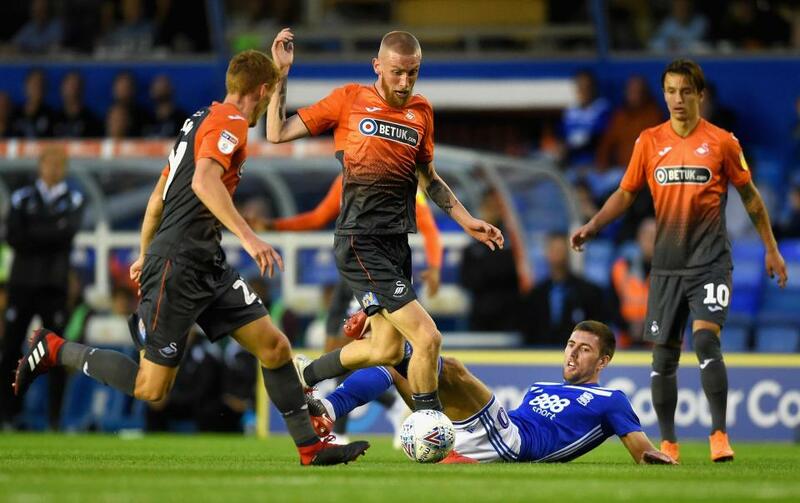 Birmingham City were left to rue their missed opportunities as they failed to find a way past a resilient Swansea City side in the ‘Garry Monk Derby’. Despite creating a host of gilt-edged chances in the opening half an hour, the Blues were ultimately frustrated by Graham Potter’s men. Lukasz Jutkiewicz had the best chance for the hosts, but skewed his left-footed shot wide after great work by Jota. The result moves the Swans up to second in the table, having played a game more than the rest of the sides in the Play-Off places. There was no response from the visitors – who managed just one first-half shot to Birmingham’s 14 – and the hosts continued to press after the break. But the clear chances dried up as the visitors finally began to find their footing after the hour. While there was no goal threat they at least stemmed the tide of Birmingham attacks as the hosts lost their first-half spark. Omar Bogle did head over with 18 minutes left and substitute Che Adams blazed wildly off target following Jota’s chip. And Blues were forced to settle for a point when Jutkiewicz’s late header dropped wide.